Cameron was a guest on SiriusXM’s Canada Talks Speak Easy with Carla Collins yesterday. While he was waiting to be interviewed, he noticed another man sitting alone. Cameron introduced himself and asked the man, whose name was Scott, what he was there to talk about. 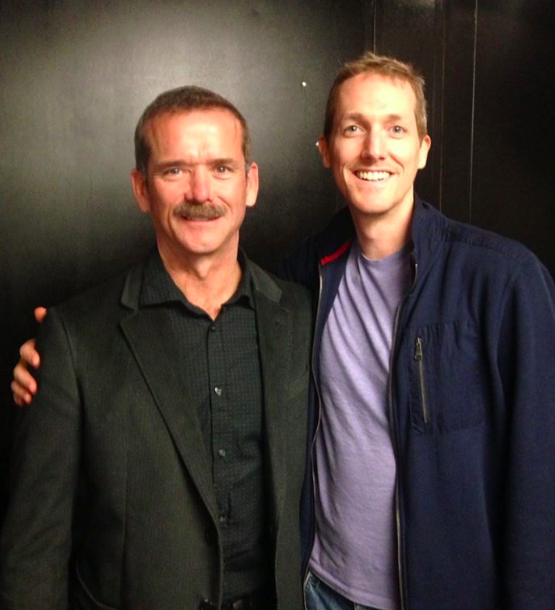 “Oh, I’m with Commander Hadfield,” Scott replied, indicating the studio. They laughed, and Scott asked what Cameron did. He explained that he was there to talk about improv, and how it helped him overcome his anxiety. If you’d like to learn more about improv for anxiety (and being here now), check out Cameron’s new website at playwithfireimprov.com.